Jessica Helgerson Interior Design, with project manager and lead designer Emily Kudsen Leland at the helm, remade a Portland abode with a crisp paint palette: Benjamin Moore’s Wrought Iron for the cladding and Venetian Gold for the front door. Landscape design is by Lilyvilla Gardens. In true mid-century fashion, a George Nelson Bubble Lamp is paired with an Eames Lounge by Charles and Ray Eames in a corner of the living room. The glass walls and mitered corner are original features of architect Saul Zaik’s 1956 design. The living room sports a panoply of wood: Douglas fir for the ceiling, hemlock for the walls, and stained oak for the floor. The sofa is the Neo model by Bensen and the rug is vintage. The sofa in the family room was designed by Helgerson with Magnifique fabric by Kravet. The 265 Wall Lamp is by Paolo Rizzatto for Flos, and the pine coffee table is from The Good Mod, a local shop in Portland. A vintage Molded Plywood Lounge Chair (LCW) by Charles and Ray Eames for Herman Miller sits in front of built-in shelving in untreated hemlock. For the kitchen, master bath, and kids’ bathroom, the designers chose three different hues of Savoy stacked mosaic tile from Portland-based manufacturer Ann Sacks. Tractor barstools by BassamFellows pull up to a PentalQuartz countertop. The gas cooktop, oven, and dishwasher are by Miele. An assortment of dining chairs, including vintage iterations on the Eames shell chair by Charles and Ray Eames and Stokke's Tripp Trapp chair, are clustered around a table lit by a pendant lamp by Coco Flip Design Studio. Helgerson selected white Savoy 1”x4” stacked tiles from Ann Sacks for both the kitchen and bathroom. The flooring in the master bath is vein-cut Ocean Silver travertine. The custom bathroom vanity is stained birch, the polished chrome fixtures are from Hansgrohe’s Axor Uno2 line, and the chair is upholstered in Checker by Alexander Girard for Maharam. Arne Jacobsen's AJ Wall Lamps are in the master bedroom, which is furnished with a Case Study bed and a Series 11 6 Drawer Console by Blu Dot. The wool carpet is from Iberia. A Bird Chair by Harry Bertoia for Knoll and a Grasshopper Lamp by Greta Grossman round out the room. Lilyvilla Gardens built custom wood and concrete steps connecting the street to the house, which flow into an exposed patio under the refurbished carport. In addition to collecting midcentury furniture, Ty Milford is a vintage car aficionado and owner of two cherry red Porsches. Speaking to his original design, architect Saul Zaik says, “We were really just building boxes with a bunch of windows but experimenting with how you integrated indoor and outdoor spaces.” The house has seven different openings to the exterior, allowing different courtyard or patio settings for a range of outdoor activities, including seating for a gathering on the street-facing side. The Milfords hired Lilyvilla Gardens for the landscaping around the house, including variegated bluestone steps with thyme joints. The exterior sconces are original to Zaik's 1956 design. JHID rebuilt the rear deck off the living room, which connects to an aggregate patio; the two architectural elements are connected by pathways in variegated bluestone designed by Lilyvilla Gardens. Kelly Milford helps son Adam out of the hot tub nestled on a wood deck in back of the house. The exterior paint is Wrought Iron by Benjamin Moore. Big Branch Woodworking and Lackey Construction fabricated the cabinetry throughout the home, including the birch built-ins in the mudroom, designed by Jessica Helgerson Interior Design. Each family member has his or her own cubby with storage for coats, shoes, hats and gloves, with built-in outlets for charging iPhones. The kids' room is outfitted with a cheerful orange Case Study daybed from Modernica and a selection of vintage maps and artwork. JHID maintained the essential layout of the home which Zaik had oriented to its site. "Living here [in Portland] all my life," he says, "I value sunlight." As International Style modernism flourished in the mid-20th century, architects in the Pacific Northwest developed a regional version, fusing the glassy transparency of Mies van der Rohe and Richard Neutra with a reverence for natural wood and pitched roofs. But by the time Ty and Kelly Milford found one such gem, a succession of past alterations had marred its original design. 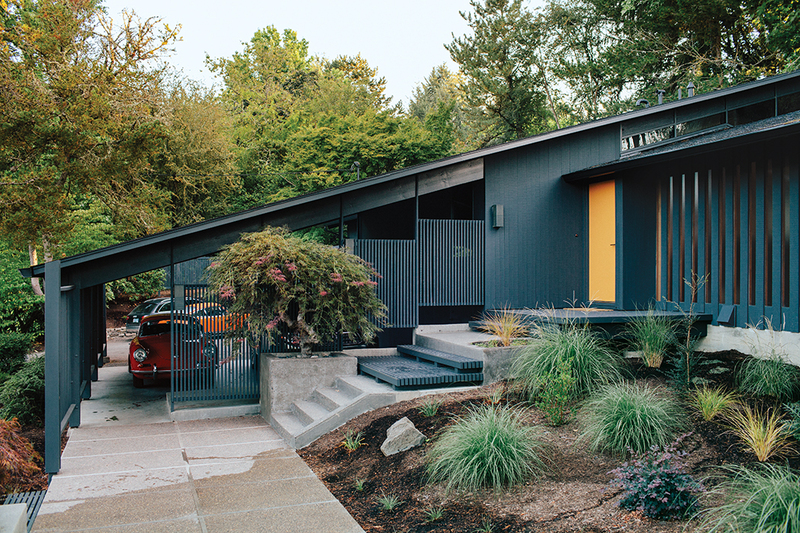 Acclaimed local architect Saul Zaik had built the wood-clad Feldman House in Southwest Portland in 1956, with a dramatically cantilevered, low-pitched gable roof and floor-to-ceiling glass. So why was there a post right in the middle of the family room? Why were the ceilings taller in the bathroom than in the master bedroom? Luckily, they could still ask him; the elder architect came to visit the house during construction to answer questions and bless the renovation. “[My generation of architects] were all World War II veterans, and we were out to change the idea of architecture,” says Zaik, who, at age 87, still practices today. “We were really just building boxes with a bunch of windows but experimenting with how you integrated indoor and outdoor spaces.” Indeed, the Milfords’ home has seven different openings to the exterior, allowing different courtyard or patio settings for a range of outdoor activities: tables and seating for a gathering on the street-facing side, a hot tub nestled on a wood deck in back, and, off the kids’ rooms, a swing set that’s built into a load-bearing beam. The house’s primary public space—an adjoining living and dining area—was left largely intact, with floor-to-ceiling glass walls that form a mitered corner redolent of Frank Lloyd Wright. (A scene from the 1994 Harvey Keitel movie Imaginary Crimes was even filmed in the house, with one of the characters making note of the glass corner.) The room sports a host of different woods: a Douglas fir ceiling, restored hemlock walls, a newly stained oak floor, and an original credenza made from Japanese sen ash. In the kitchen, the raised floors—dating to one of the ill-advised remodels and done to mitigate asbestos without removing it—had to go, as did a redundant second front door. The design team, including the general contractor Lackey Construction, also added new birch cabinetry and created a custom screen along one side of the kitchen counter that apes the original entry’s alternating glass-and-wood facade. The family room had been expanded over the years, hence the wayward post in the middle; JHID’s plan restored a wall that had been there, shrinking the space back to its original size but making it feel expansive with a new built-in sectional sofa. This reconfigured wall created enough space to relocate the master bedroom to a quieter part of the house, away from the kids’ bedrooms, with its own small outdoor courtyard. The back bedrooms, which during a later expansion had been constructed on the cheap with aluminum windows and low ceilings, were both reconfigured and resurfaced to be congruent with the rest of the house. A new master bathroom adds a touch of elegance, with gray travertine floors and vintage Ann Sacks–tile walls. An entry from the carport was added, along with a new mudroom that features built-in wood alcoves for each family member.